William Dodge James was the heir to two American fortunes when he purchased West Dean Park in Sussex for his new wife in 1900. The Willie James' were close friends of Edward II; according to prevalent rumors, Mrs. James a good bit closer than her husband. West Dean Park became the epitome of Edwardian splendor and just as quickly became a dated relic. Willy’s son, Edward, inherited the house, turning an ancillary property, Monkton House, into a surrealist dream. 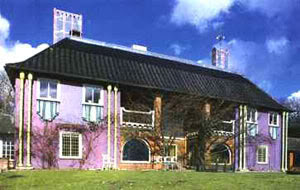 He lived in Monkton House for a short time with his wife, the dancer Tilly Losch. – the whole spelling your favorite tune? Edward James took the same idea in a different direction (and one I like much better than the musical notes). 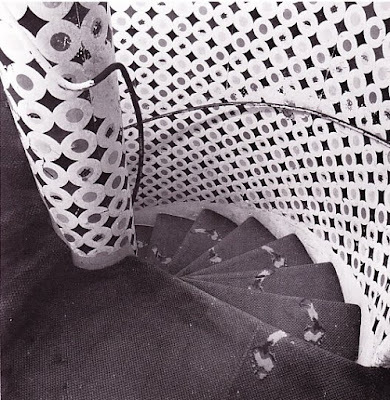 At Monkton House there was a circular stair case from the bathroom to the master bedroom. 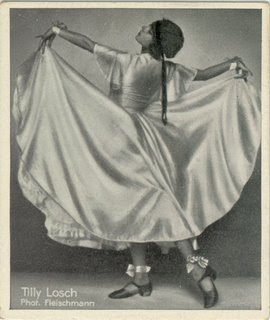 One day, Tilly Losch ran up the stairs in her bare feet. He was so taken with her footprints on the carpet that he commissioned a replacement carpet featuring her footprints woven into the fabric. Alas, they parted after only six months amid rumors that the marriage was unconsummated. He was a big old homosexual. He was more than willing, but she was too busy sleeping around. While the marriage failed, the carpet endures. In the long run I'm sure he prefered the hall carpet with his favourite hound's paw prints. Undoubtedly, the more loyal of the two. This house was the best to work in the carpets were so thick and soft under foot, and hoovering the walls was fun. Interesting and well thought through blog, stunning picture of Tilly and those famous foot prints. Congratulations and thanks for displaying these to the world. After the farce with Edward James, Tilly of course became the Sixth Countess of Carnarvon, wife of Porchey, the randy Sixth Earl. You and your fellow bloggers may wish to know that following on from my books on Lady Evelyn Stanhope and Elsie Howard, the two Fourth Countesses of Carnarvon and Almina Wombwell, the indefatigable Fifth Countess of Carnarvon, I have now completed a book on the two Sixth Countesses of Carnarvon. " Catherine and Tilly: Porchey Carnarvon's Two Duped Wives. The Tragic Tales of the Sixth Countesses of Carnarvon" . This will play out for what it’s worth or not alongside Highclere's latest romp on the American refugee Catherine Wendell. My narrative draws on original papers, newspapers and the Wendell papers in Portsmouth Athenaeum, in Maine, USA as well as the good will of members of the Wendell family. It will also be based on interviews and testimony from several people who knew and dearly loved Catherine. The book also includes a long detailed narrative on the life and times of Tilly Losch the great dancer, and bit part actress, an icon of the Twentieth Century, a sort of wonder woman with the combined force of Garbo, Monroe, Madonna and Lady Gaga. Kind Regards, William Cross, FSA Scot. Willie, thanks for the post. Hope this drives some readers to you books.